Full title: Nothing to Envy: Real Lives in North Korea. I’ve had this book since February and was finally spurred to pick it out of the pile by the death of Kim Jong-il. It’s based on interviews with refugees from North Korea which were conducted over several years by Barbara Demick, an American journalist. She interweaves their stories into a chronological narrative to create a picture of everyday life in North Korea over the past few decades. Obviously there are limitations created by her almost complete lack of access to the country itself, but she focussed on people from a particular city, Chongjin, near the Chinese border, and did her best to cross-check as many details as possible. The result is a very solid and convincing picture. It’s a fascinating and horribly grim picture of a personality cult, rigid bureaucratic social control, and constant fear that saying the wrong thing could get you sent to the gulags… and then the famine kicks in and it gets even worse. It seems bizarre that a Stalinist system like this can still survive into the twenty-first century, decades after Communism collapsed elsewhere and even as South Korea and China become rapidly more prosperous. But I guess the really extraordinary thing is that it lasted as long as it did in Russia, China and Eastern Europe. Anyway, it’s a good book, well worth reading. 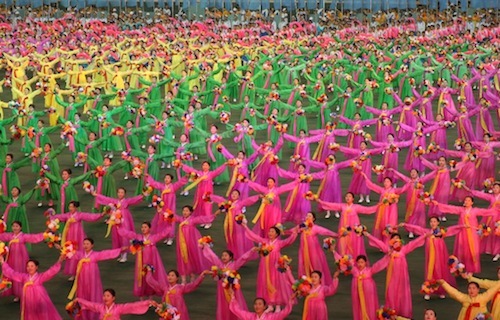 » The photo Arirang (DPRK) is © Gilad Rom and used under a CC attribution licence.